Posted on Fri 8 Apr 2016 at 5:15 PM PST. Filed under General. – Get some paint on a plastic palette. About the size of a raisin for a small area. – On a separate palette hole, add thrice as much water as the raisin size of paint above. – Use a size 8 “pointed-round” soft brush (Kolinsky sounds good). – Mix the paint with some Titanium White. – With the tip of the brush, get some paint (just a little bit, maybe about 1/6th of it), and mix it well with the water. It will create a very pale color, but it will still have a color. – Strain away as much water as possible from the brush. It should not be full of water when you lay it on paper. – Start laying the pale color on your paper. Use as large brush strokes as possible, and move the pools of paint towards a single direction. – Let it dry for a minute or so. – Add 2/6ths of the paint (basically, double as much as before), on a bit more water than before (maybe about 1.5 times as much as before). – Mix well, strain the brush, and paint over, the same way as before. – Let it dry for 3 minutes or so. – Add the rest of the paint to about 2x more water as in the beginning, strain the brush, paint over again. The consistency should be that of a melted ice cream. – Let it dry for 5 minutes before you decide if you need yet another hand on top, or add details on it. That’s it. Basically, you need multiple layers to get a smooth, matte finish. Another way to do it with gouache, is to lay gesso+medium in the paper before painting, just as if you were using acrylics. The 2-3 gesso hands would then serve the same way as the multiple hands of paint. Personally, I prefer the first method. Posted on Mon 23 Nov 2015 at 10:41 PM PST. Filed under General. Posted on Fri 13 Nov 2015 at 1:27 PM PST. Filed under General. Something very interesting is happening right now in the Paleo turf. The Paleo poster boy, Robb Wolf, got into an online shout match with Dr Jack Kruse, the “quantum epigenetics” poster boy. Robb calls Jack a quasi-mystical fraud, while Jack simply asks Robb to look at the evidence and research before he opens his mouth. Robb is the big guy here, followed by many thousands, and having written the Paleo “bible”. Often, the 4-5 well known Paleo gurus would go in an all-out attack against the medical establishment, arguing how closed minded that establishment is for not agreeing with their points of view (e.g. that grains & pseudograins are all very bad for you, vegetable seed oils are bad, legumes are bad, dairy is bad etc). They basically call them out for not looking too hard at the evidence, that long-term health “starts with food”. However, as with any system, after a while, it gets cemented. Same with the Paleo system. While it has somewhat evolved in the last 3 years, to not be as hard-core against fermented dairy, or against white rice, it still holds its basic truths cemented, and no one seem to want to research further. The various gurus have a reputation to protect, and products to sell now, so they need to stay true to what they originally preached. So, when someone like Dr Jack Kruse comes along to shake their castle, by claiming that “it starts with light”, they themselves become the same as the closed minded medical establishment they hate. They react extremely violently against Kruse, without bothering to read his evidence or even just trying to understand his logic. They try to prevent the carpet pulling (that is probably inevitable as science moves on). It’s funny, really. They fell under the same trap as the medical establishment has. As for Dr Kruse, he has some blame for the situation too: the guy can’t write properly. The reason why Paleo gurus are “gurus”, is because they know how to communicate. They can write in a very understandable, friendly way, so the people fall behind them easily. Jack on the other hand, feels like he has a super-computer brain that is connected to the outside world only via a 56k modem instead. It also doesn’t help that he’s arrogant, and just not very likable as a person. But that doesn’t mean that what he argues is wrong. It is my feeling that he’s the one who’s on the right path towards a deeper truth, but he has this extreme difficulty getting the information out properly. Basically, what Dr Kruse is claiming is that we’re quantum machines. For that machine to work, we need a lot of natural UVB light (in the AM) and no blue light at night. Basically, he’s arguing that proper circadian rhythms, and being a lot outdoors, can have a bigger effect to long term health than “simply cutting down grains”. In terms of food, he argues that the biggest change one should make, is to add more seafood in their diet, because the iodine/DHA help with transporting energy in the mitochondria. This could explain why Okinawans used to live to be over 120 years old, even if they ate a few grains, and lots of soy (both an anathema to the Paleo doctrine). It’s because they would also eat ungodly amounts of seafood (especially seaweed), and they would work outdoors in their gardens all the time. I can see what he says can sound like mumbo-jumbo, however, I think that what he’s arguing makes sense to me, and he does have basis on facts. Just not Western facts. A lot of the research he cites on his blog, are from Russian research papers. Some of that research has been done by UK and US scientists, but not everything. He has gone into great lengths to get access to these papers, and to have them translated. So, he’s definitely controversial. But I really think he’s on to something. Posted on Tue 6 Oct 2015 at 12:07 AM PST. Filed under General. There are two types of dieting for weight loss: the one is plain calorie restriction, and the other one is cutting down specific parts of the normal human diet (e.g. carbs for low carb diets, or fats for low-fat vegan diets). Research has shown that the second way is a better way to lose weight and keep it off too. 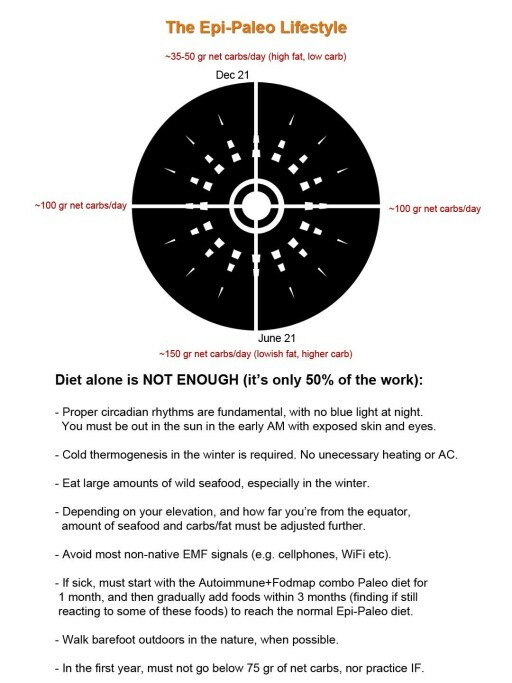 Many have gone either keto or vegan and have lost weight and seen health changes (at least for a while, because after a few months, it backfires due to lack of specific nutrients — these diets shouldn’t be followed for more than 3 months IMHO). Speaking for me, while I’m Paleo for life (since it has fixed most of my health ailments), one thing hasn’t worked: weight loss. Men do lose weight faster on Paleo, without effort. They can eat what they want, as long as it’s on the approved list. For women, who are genetically designed to keep on their fat for evolutionary/birth reasons, it’s a hit or miss thing. For some women it works, for others, especially those with metabolic disorder, it fixes the rest of their health in general, but it doesn’t make them lose weight (in other words, it doesn’t clear the metabolic disorder completely). Even worse, 2/3 of women who go keto, end up with thyroid problems (like I have). The only diet that works for weight loss for these women, is again, calorie restriction. Which of course, in the long run, also doesn’t work. Research now and again has shown that people on a calorie restricted diet end up getting all their weight back within a few months, plus an additional 10%. So after a quick test with a low calorie Paleo diet (1200 calories per day, I’m very short), it soon became clear that it was unsustainable, since it made you think of food 24/7. Keto fucked up my thyroid, and plain Paleo simply doesn’t make me lose weight. However, the real problem of low calorie diets exists elsewhere. The real danger is in malnutrition. When you go down to 1200 calories from 1800-2000 calories per day, it’s not just calories you minimize. It’s nutrients. IF the kind of food we had today was as nutrient-dense as it was in the ancient times, then going down to low calorie would not be a problem. In fact, many praise the traditional Japanese diets for being small-portioned. But the point these people are missing is that even if they were eating small quantities, they were getting A LOT of nutrients. They didn’t NEED to eat more! Today, with modern, selected varieties, this is simply not possible. And the sad part is, that if you don’t OVER-EAT, you will NOT get enough nutrients. 2000 calories a day are bare minimum to acquire the right nutrients! And that’s an amount that doesn’t help with weight loss at all. In fact, in some research paper recently, they found that tribal diets are up to 15 times more nutrient-dense than western diets, and up to 10 times more nutrient dense than the Paleo diet. So basically, going Paleo helps your health, but since we don’t have access to ancient varieties anymore, even Paleo won’t ultimately save you. This situation has given me quite some depression to be honest: Eat little, get malnutritioned. Eat more, get fat, and still remain malnutritioned. There’s no winning in the West. These aren’t good times for food and health. The only thing that could work is to buy a farm (somewhere where the water is still clean), find ancient heirloom varieties for your garden, and non-selected breeds of animals, and take the matter 100% on to your own hands. Simply buying organic broccoli or kale at the farmer’s market will only get you so far. Father than the standard western diet, but not as far as some people must go to battle their medical issues.